I recently stumbled across a set of scanned comicbook images from various books I sold out of my collection. Before I would package everything up, I would browse through the individual pages looking for house ads, iconic panels, or other trivia-minded images that would be fun to keep as a record for some reason or another. Just add this to the long list of comicbook projects I like to busy myself with. Ha. Anyway, I figured these images could finally be used, finding a home on the site in an effort to play catch up but in what format? I didn’t want to just throw them all up at one time on Tumblr with no explanation or reason. Some of the images I’ve long forgotten about – seeing them again sparked interest in either reading those characters again, or reminded me of some obscure hero or villain, etc. What would be the best way to use them after all these years? Then I thought about stuff going on right now and one of the images jumped out: the central image of the below 4X4 featuring a scanned group shot of the Morrison/Quitely version of the Crime Syndicate of Amerika from JLA #107 (cover dated Dec’04) written by Kurt Busiek, pencils by Ron Garney, inks by Dan Green, colors by David Baron and letters by Jared Fletcher (whew). I was ready to just throw that particular image up as a nod to the goings-on in Forever Evil… and be done with it, but then I remembered that the 4X4 series of posts was intentional for this very kind of thing: to showcase a certain comic (or character, or artist, or… ) in a way to give a supplemental visual to a short review or discussion such as the previous 4X4 on All-New X-Men issues #1-12. Once that clicked, the rest fell into place. – (top middle image) From the CSA’s first appearance in Justice League of America #29 (Aug’64). I owned a beat up version of that issue that I purchased on the cheap. The way Owlman is hunching and twisting his cape around his form always stuck out as an interesting personality trait. 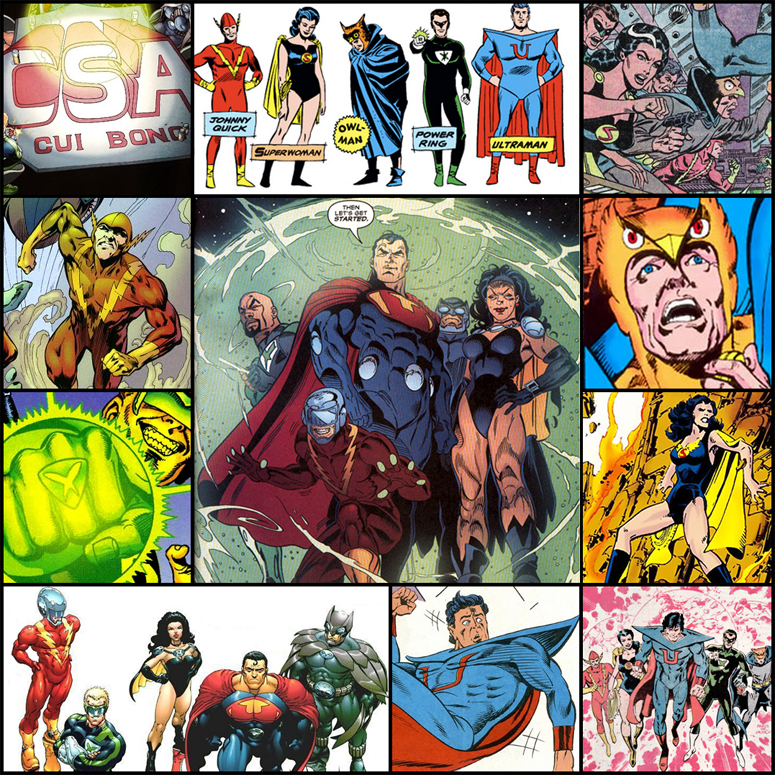 – (upper right corner) The JLA/JSA/All-Star Squadron crossover from 1982 that featured the CSA (and Per Degaton and Earth-Prime). That’s Don Heck on pencils. I was familiar with his style from Wonder Woman comics at that time. I wasn’t the biggest fan, but I came to appreciate his career once I got to know more about his place in comics. I purchased that crossover story from back issue bins on my quest to compile all Perez related issues – he was the cover artist for the JLA during this story and I was initially going to use the cover of the CSA bursting out of a Transmatter Cube to confront the JLA – because it really does stand out for me – but I decided not to since I had three other Perez images on the grid. Better to give Don Heck some welcomed space. – (bottom right corner) The Paris Cullins pencilled entry from Who’s Who #5 (1985). I was such a fan of his style in the 80s. – (bottom middle) A great moment from Animal Man #23 (May’90) where Ultraman learns that there’s something else out there beyond the borders of a comicbook panel. Morrison played around with DC characters being stuck in limbo – especially those lost because of the Crisis… – characters who wanted to be back in comics to be read, not retired. – (bottom left corner) Frank Quitely cover to the Grant Morrison Earth 2 HC (2000). This version of the characters would be called the Crime Syndicate of Amerika and finally gave Owlman a decent costume. The team also reflected what was going on in the DCU by making Power Ring and Johnny Quick new men behind the masks in reflection to Kyle Rayner and Wally West taking over the mantles of Green Lantern and Flash. It’s this version and story that inspired the JL: Crisis on Two Earths animated movie. The upper left corner image is also from Earth 2, featuring the CSA’s meeting table with their motto “To Whose Benefit?”. While it’s “out of order” in terms of its place on the grid, it nonetheless earns its place by being a nice beginning and ending visual for the outer images. – Finally, the two left middle images are of the Earth 2-version of Power Ring from JLA/Avengers #1 by George Perez featuring a closeup of his ring. And a throwback version of Johnny Quick by Alan Davis for his JLA: Another Nail Elseworlds mini-series. I wanted to include that full Alan Davis splash page of the whole team but I needed a solo Johnny Quick image instead. Look up that full Davis image. It’s a beauty. There are certainly other CSA appearances – especially post-2004 – some that I’ve read, some that I’ve never seen. I just wanted to stick with those memories that jumped out leading up to the main central image that I found to give it all perspective and to keep it personal to my reading experience. Thinking about all these comics have stoked the fire even more to want to catch up to Forever Evil and to read any other appearances that I haven’t hit yet (such as James Robinson’s run on JLA, Busiek’s Trinity, etc). I also look forward to going through those other images to see what else I can drum up for future 4X4s. And by all means, if you have history with the CSA – favorite moments, panels, sketches, etc – throw some feedback my way!